Welcome to the Medieval Times with Glory and Britannia Video Slot, when Kings, Magicians and Dukes were everywhere; with lush green meadows and mighty walls of the great Castle in the background. There are Low Payout Symbols like rings and crowns and playing cards adorning the slot game along with the ‘Lion Court of Arms’ being the highest winning symbol. This 5 reels and 3 rows slot game is set in the historical era where King Arthur, Robin Hood, Lady of the Lake and Merlin etc. are added as extra features to the reel, giving you the perfect opportunity to win free spins, re-spins and up to 5x multipliers. With over 243 ways to win, this Playtech invention is filled with free bonus games, re- spins, high pay out symbols, Wilds & Scatters and much more. Read this online slot review to know more about “Glory and Britannia Slots”, along with a free demo version and a list of casinos where you can play for real money. How to Play the Glory and Britannia Slots Game ? Visit any casino site and open 'Glory and Britannia' Slot Game. Once there choose a suitable option between "Play for real money" or "Play for fun". Once there, you can select the bet amount from '£0.30 (or 30p) to £300', as per your choice. In the "Balance" section, you can see your account money and can locate your winnings in the "Total Win" tab. You can then hit the green button on the right side of the slot reel, otherwise known as the "Spin" icon to spin the reels. For "Autoplay", you can 'Press and Hold' the Spin button and open the Auto Play Menu. You can set the number of plays, your stake etc. on the menu and then you can start playing for fun. Click on the "Shop" icon at the top right corner of the slot reel to visit and activate the "Side Bet Features" or simply click on any "Side Bet Features" located on the top of the reel to activate your favorite History Figurine. Click on the "?" icon to learn about the General Rules of the slot game and on any one of the icons adjacent to the ‘Bet Ways’ or "Balance" to see the "Pay Table", "Bonus Features" and all the other game details. There are a total of 243 ways (paylines or bet lines) in which you can win in this slot game. All pay outs are cashed from the left direction to the right, from reel number 1 except the scatter symbol. Only the highest win is paid or cashed out per way. Scatter Symbol pays, no matter where it appears. All the wins or payouts are valued as depicted in the pay table, in respect to the current bet amount. There are 7 different Side Bets in the game that can be selected and activated by the player for a better pay out. The R.T.P. or Return To Player of ”Glory and Britannia Slot” is 91.89%. This can change to 95.94% (in case the Side Bet Features are chosen). Any type of malfunctions will void all game plays as well as all pays. 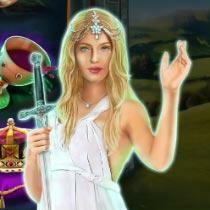 There are in total 243 ways in which a player can win in “Glory and Britannia Slot”. However, when the ‘Free Spins Feature’ is activated, an extra row is added to the other wise 5 reels and 3 rows slots game. Thus, inadvertently increasing the chance of a pay out or a win by 1,024 ways. With a soulful lute playing in the background, this medieval themed video slot game brings you back a few centuries where King Arthur, Merlin, Lady of the Lake and Robin Hood are still in attendance. A beautiful Castle rests in the backdrop where as the Crowns, Golden Books and Rings grace the slot reel. The Red Shield with the Lion Crest is the highest paying symbol and the Golden Cross acts as the Wild. The ‘Cross of St. George’ signifies the ‘Scatter Symbol’ where as the Royal Goblet brings in the wine. The entire theme and characters refreshes up the lessons learned in history and inspires you to march in to the game to win a big prize like the Royal Knight you are. Bet Value : The minimum bet allowed in this video slot game is £0.30 where as the maximum bet amount is £300, which can rise up to £1000 when all the “Side Bet Features” are activated at once. Shop : This icon is located on the top right corner of the screen. It consists of the additional ‘Side Bet Features’, that are included in the slot game for the mere purpose of increasing your chances of winning as well as keeping things interesting. Spin : The "Spin" icon or button is represented by a green icon on the right side of the screen. You can click on the rotating arrows to spin the reels. Auto Play : The ‘Spin’ button also acts as ‘AutoPlay’. A player can ‘Press and Hold’ the Spin button to open the Auto Play Menu. Here, you can select the stake you want to place per play as well as the number of plays (up to a total of 100 times). You can also choose the ‘Maximum Loss Limit’ along with the ‘Single Win Limit’ to determine when the Autoplay should be stopped. Then, you can click on ‘Confirm’ or ‘Reset’ the chosen values in order to execute your next course of action. Wild Symbols : The Wild Symbol is represented by a “Golden Cross”. It can appear on reel 2, 3 and 4 only. It acts as a substitute to all the symbols on the reel except the Scatter Symbol. Scatter Symbols : The Scatter Symbol is represented by “St. George’s Cross”. This symbol pays no matter the position on the slot reel. All wins from the Scatter Symbol are multiplied by the total bet amount and then they are added to the way wins. Appearance of the Scatter 3, 4 or 5 times on a single spin generates a pay out that will be 2, 5 or 20 times your stake/ bet. This also triggers the ‘Free Spins Feature’ of the game. Standard Reel Symbols : The standard reel symbols include “High Payout Symbols” like The Lion Crest Shield (which is the highest paying symbol), The Crown, The Goblet, The Ring and The Golden Book where as the “Low Payout Symbols” include the Royal Playing Cards - from A to 9 i.e. A, K, Q, J, 10 and 9. Glory and Britannia Slot Game is a product of Playtech, which is renowned as one of the world’s biggest online gaming software provider. Since its inception, it has provided its loyal audiences or customers with some of the most popular themed slot machines like ‘Age of the Gods Series, or Marvel Slots like ‘Iron man’ and ‘The incredible Hulk’ etc. This software manufacturer is known to be highly secure and reliable. It is highly compatible on all your known devices whether its a Mobile Phone, PC, Laptop or a Tablet. Playtech Casino Games provide you with plethora of bonuses and free spins. So, Play on this Playtech Slot for free and get ready to find about what big wins are in store for you here. This icon is on the top right corner of your screen. It lists 7 Special Game Features that act as optional or additional side bets. Each of these side bets adds 10 credits* to your bet/ stake amount. A player can activate more than one (or all) Side Bet Features on a single spin. However, these features cannot be re- triggered. Lady of the Lake Feature : “Lady of the Lake” awards a player with 3 re- spins randomly after a paid spin, with all the low payout symbols removed. Templar Knight Feature : The “Templar Knight” awards a player with a random re- spin along with a set of stacked Mystery Treasure Chests, that were added to all the reels during the re- spin. These treasure chests open up to reveal all the same randomly selected symbols. 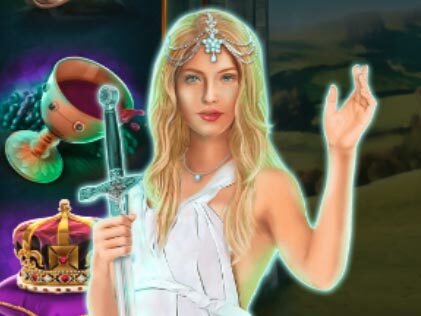 Guinevere Feature : In this Feature, “Guinevere” rewards a player with a re- spin along with an enchanted symbol that spreads after the wins from the re- spin is paid out. This symbol will spread on the reels to credit additional wins. Merlin Feature : The almighty “Merlin” spreads its magic by rewarding not just an extra spin (or re- spin) but, it also casts a spell to turn up to 1, 2 or 3 reels into Wild. Duke of York Feature : The “Duke of York” chooses to appear during your Free Spins and awards you with a 2x, 3x or 5x multiplier on your winnings. King Arthur Feature : “King Arthur” appears when Free Spins are triggered and lives up to his name by rewarding a player with up to 20 additional or extra Free Spins. The free spins added in this feature can further activate other side bet features. Robin Hood Feature : Just like the stories, “Robin Hood” is as giving as the King, as it appears randomly and awards a player with a re- spin (or extra spin) along with additional Wilds during Free Spins. It can turn up to 12 landing symbols in to Wilds. *Please Note : ‘10 Credits = £0.10’, for the lowest stake of £0.30. In simple terms, the credit value changes in respect to your current bet or stake. **You can activate the Set Bet Features by visiting the Shop or Clicking on the Side Bet Shop Icon and select any of the above features to activate them. Similarly, you can click on the respective features to deselect or deactivate them as well. When 3 or more Scatter Symbols appear on the slot reel, 15 free Spins or 15 Free games are activated/ triggered. In the duration of these free spins, an extra row will be added to the reels thus, extending the chance to win in up to a total of 1024 ways. However, the ‘Free Spins Feature’ cannot be re- triggered. The value of the all the bets placed during free spins will be the same as the bet or stake that activated or triggered the feature. If it is activated, the seven ‘Side Bet Features’ may get triggered during the free spins as well. The "Pay Table" above dictates the minimum pay out with respect to the lowest bet amount (i.e. £0.30). The pay outs will increase or decrease in relation to your current bet. 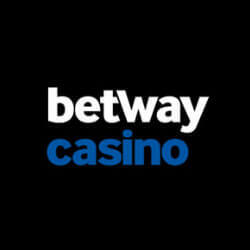 The maximum possible payout is £20,000.00 when all the ‘Side Bet Features’ are activated. This 5*3 slot game takes us on a historical adventure with castles and kings and magic. You can stake a claim from a low coin range of £0.30 up to £1.00 to the high coin range of £300 up to £1000 per spin. There are Goblets of Wine, Royals Rings, Crowns of the King and much more; acting as standard reel symbols. For high pay outs and bigger winnings, Playtech has introduced Free Spins Features, Side Bet Features like King Arthur, Merlin, Duke of York and Robin Hood, Wild & Scatter Symbols etc. There are about 243 ways to win in the game which can expand up to 1,024 ways when you activate one or all of the additional figurines from the English history. You can claim Mystery Symbols and Stacked Treasure Chests by activating features from the Side Bet Shop or unlock 15 Free Spins when 3 or more Scatter Symbols lie across the reel and raise your stake to 20x. The RTP of the slot game is calculated as 90.89%, which can be raised to a good 95.94% when ‘Side Bets’ are activated by the player. Check the ‘Free Play’ version of the game to know if its worth staking your money and then be ready to win the royal bucks. Please enter your review for the Glory and Britannia Slot.